This tutorial guides you through the process of creating a simple application powered by LinqConnect technology. In less than 5 minutes you will have a ready-to-use data access layer for your business objects. LinqConnect (formerly known as LINQ to Oracle) is the fast and lightweight ORM solution, which is closely compatible to Microsoft LINQ to SQL and contains its own advanced features, such as complex type support, advanced data fetching options, configurable compiled query caching, and others. LINQ stands for Language-Integrated Query, which means that data retrieval is no longer a separate language. The LINQ engine allows .NET applications to connect to databases without bothering much about columns and rows. The data you receive is automatically formed as objects ready to use by your business logic. LINQ to Relational Data may be thought of as an object-relational mapping (ORM) tool. The type-safe LINQ queries get compiled into MSIL on the fly, and the query clauses are translated into SQL and sent to Oracle server for execution. This makes your data access layer safer, faster, and greatly more convenient to design. In order to connect to Oracle server you need the server itself running, dotConnect for Oracle installed and IDE running. LinqConnect requires .NET Framework 3.5, Visual Studio 2008, and Oracle server 9.2.0.4 or higher. Note that LinqConnect feature is only available in Professional and Developer Editions of dotConnect for Oracle. Create a new console application in Visual Studio. It could be any other project type as well, but for simplicity's sake we'll use console project throughout the tutorial. The rest of the tutorial assumes that the name of the project is ConsoleApplication1. If you project is named otherwise, you will have to substitute this name with the actual one in Solution Explorer. 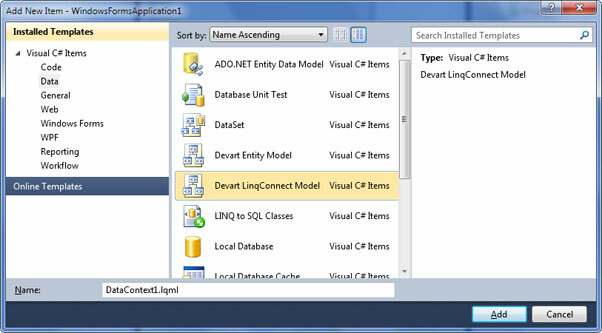 Add Devart LinqConnect Model to the project. To do this, right-click on the project node in Solution Explorer, point to Add, click New Item.... 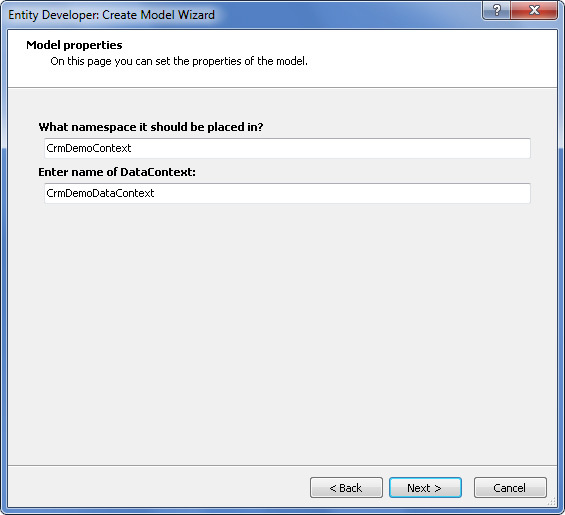 In the Add New Item dialog select Data category, choose Devart LinqConnect Model template, and click Add. 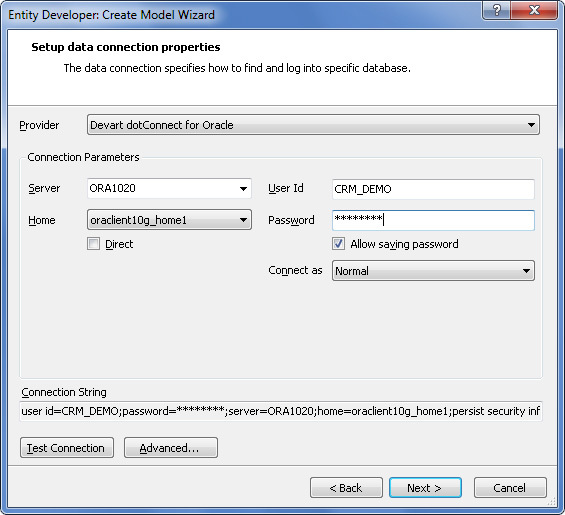 This automatically launches Create New Model wizard, which creates a new empty model or generates it from database. Fill in connection settings and click Next. 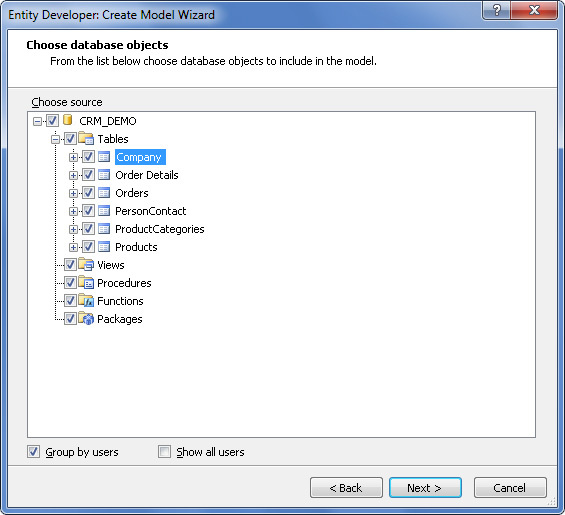 Choose database objects that will be used in the model. 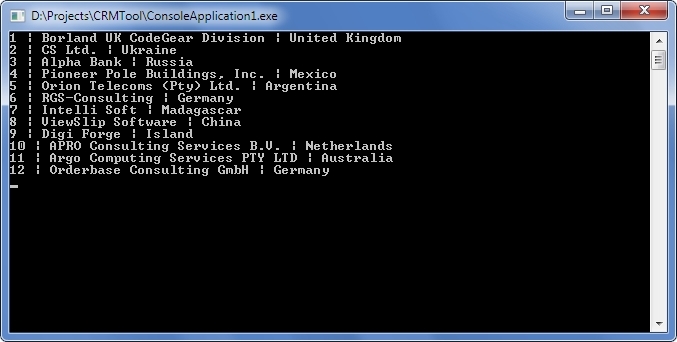 These are all objects from the crm_demo script, including auxiliary tables. Click Next. On the next screen you can adjust naming rules for entities and their members. For the CRM Demo database no rules are required, so just click Next. Input CrmDemoContext as namespace, and CrmDemoDataContext as the name of DataContext descendant. This will be the name of the main data access class. Click Next. Press Finish. The model will be generated and opened in Entity Developer. In the main menu, click File | Save. 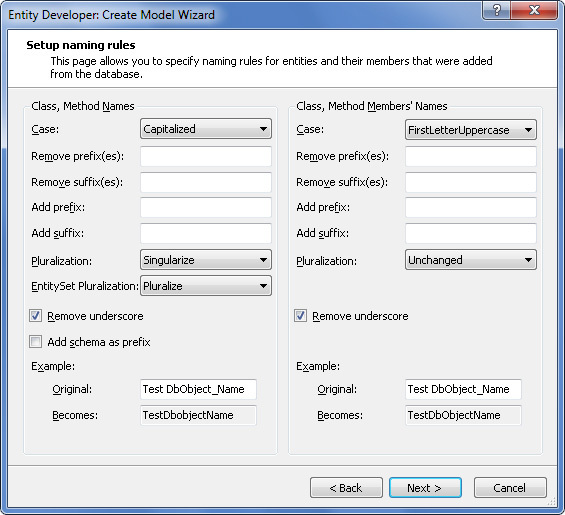 This updates the generated CrmDemoDataContext model code in Visual Studio. The model you've just generated is ready to use. Entity Developer creates classes for all selected tables that represent entities. It also creates a descendant of Devart.Data.Linq.DataContext class, which controls the connection to the database, and the whole data flow. This class includes properties and methods named after your database objects. You will use these members to retrieve and modify data in the context. The generated code is contained in the file DataContext1.Designer.cs (DataContext1.Designer.vb). You may write your own partial classes and methods for it in the file DataContext1.cs (DataContext1.vb). All LINQ to Oracle operations are executed through the DataContext descendant, which is named CrmDemoDataContext in this tutorial. To retrieve data you have to first create an instance of the context, then prepare a query with LinqConnect, and then access the object returned by the query, which may be a collection of objects or a single object. As simple as that. You prepare a query and then iterate through it as you would do with a usual collection of objects. The database interaction is performed by LinqConnect in the background. Now let's see who is who in this code sample. CrmDemoDataContext is the name of the class that knows all about your model and does everything to retrieve and modify related data in the database. All LinqConnect operations are performed within this class's properties and methods. This class is designed to be lightweight and not expensive to create, thus it is recommended to create a new DataContext instance for any 'unit of work' and dispose it after this unit is completed. query, it are arbitrary variable names in the LINQ to SQL statement. The former is used as the collection of data objects, the latter is used to reference single entities in a collection and exists inside the statement only. context.Companies refers to a public property of CrmDemoDataContext class. This property represents the collection of all companies in the context. Note that the LINQ query code just describes the query. It does not execute it. This approach is known as deferred execution. As you can see, the LINQ query statement was not changed at all. The data about the contact persons was retrieved from the database automatically when you accessed the corresponding property of the company object. This is one of the great things about LINQ: you do not have to worry about dependencies when writing queries. What earlier was adding rows to tables, now is just adding new objects to context collections. When you are ready to send the changes to the database, call SubmitChanges() method of the context. Before doing this, you must first set all properties that do not support null (Nothing) values. The SubmitChanges() method generates and executes commands that perform the equivalent INSERT, UPDATE, or DELETE statements against the data source. The InsertOnSubmit() method is created for every collection in the context. This method stores in the database information about all linked objects. As shown in the example, it is only necessary to call InsertOnSubmit() once to submit both product and category objects. Note that after you have added the new product and category by submitting the changes, you cannot execute this solution again as is. To execute the solution again, change the IDs of the objects to be added. Entity instances are modified as usual. The only thing to remember is that you have to invoke the SubmitChanges() method to send the data to the database. To extract an instance from a context use the DeleteOnSubmit method of the corresponding collection. The object is removed from the collection of its type, but not destroyed. To delete the object's data from the database invoke the SubmitChanges() method. Deletion of objects is affected by attributes in the model. When DeleteRule parameter is Cascade, dependent objects are deleted automatically. When this parameter is SetNull, dependent objects are not deleted, but the relation is nullified. When no rule is specified, the order of deletion sequence is important. Now that you can perform the basic data manipulation with LinqConnect, you can move on to some advanced topics. dotConnect for Oracle includes a help section dedicated to the LinqConnect technology. You can access it online at https://www.devart.com/linqconnect/docs/. For hands-on experience use samples shipped with dotConnect for Oracle. You can access the samples from the Start menu. To understand deeper the works of LinqConnect engine you can watch the generated SQL statements in dbMonitor or using the DataContext.Log property.